The UW is committed to ensuring access and inclusion for all. Visitors should stop at a gatehouse to obtain an accessible parking permit. Please note that a UW parking permit is required for all vehicles parking on campus from Monday through Friday, 6 a.m. to 9 p.m., and Saturdays from 7 a.m. until noon. Accessible parking costs the same as other UW parking areas. Permits are issued for a specific parking lot and are valid in any disability stall or other available general stall in that lot. Parking in a different lot, or without a UW parking permit, may lead to a citation. If you are parking on campus during a time when a permit is not required (most Saturday afternoons and all day Sundays), please display your state-issued disability placard when parking in a disability stall. Parking procedures are different in the Triangle and Surgery Pavilion garages, which are managed by the UW Medical Center. The hospital’s parking validation program is available to all UWMC patients and visitors, disabled or not. For more information about these garages, visit the UWMC website. Please see the UW Bothell and UW Tacoma websites for information about accessible parking on those campuses. Matriculated students apply through Disability Resources for Students. Faculty, staff and non-matriculated students apply through the Disability Services Office. Transportation Services will issue temporary permits for up to six weeks while long-term permits are processed. Please call 206-221-3701 or email ucommute@uw.edu. Access guide: Information on accessible entrances and facilities for buildings on the University of Washington Seattle campus. 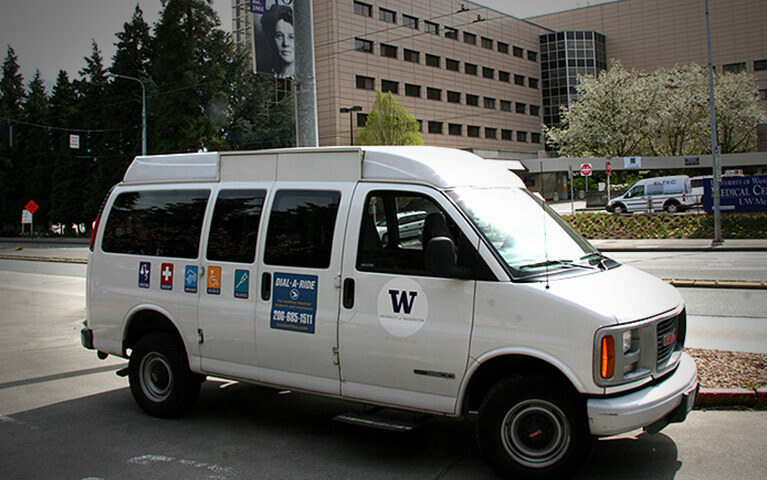 Dial-A-Ride is a free shuttle service that operates between 125 designated stop locations on the Seattle campus for faculty, staff and students with either permanent or temporary mobility limitations. Transit: Learn how you can use your U-PASS with regional paratransit services. Report a barrier to access: We want everyone to get where they need to go. Let us know if you can’t. To request accessible accommodations for football games, please call Intercollegiate Athletics Event Management at 206-543-2200 or email tickets@uw.edu. For disability accommodations at other athletics events, please call 206-616-8710. Free shuttle service around campus.